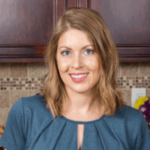 Published: Jun 20, 2014 · Modified: Jan 17, 2019 · By Jen Sobjack · This post may contain affiliate links. Homemade Cinnamon Maple Bagels that are crisp and chewy. They are a family favorite! Since I’ve begun experimenting with yeast dough, I’ve realized that nothing is better than homemade bread, of any sort. You take tangible ingredients from your kitchen and piece them together into an edible item. It’s rewarding to put so much time and effort into something and have the result turn out good enough to eat. It only took me three tries with this recipe, but I was over the moon with how the final product turned out. Bagels are something I keep on hand because they freeze well. We usually buy the packaged ones from our local bulk supplier and store them in the freezer. When you are ready to eat one, you can simply go from freezer to toaster without having to thaw out the bagel. And since we buy a ton of bagels, why not make them for near pennies. I’m all about saving a dollar when I can. So I set forth on my bagel making adventure and let me tell you, it was a challenge. I found a recipe in an old cookbook that I came across in a nearby thrift store. It’s called the Ultimate Southern Living Cookbook and it was published in 1999, so I’m not sure if it could still be found anywhere. Anyhow, I followed the recipe exactly because I have never made bagels before and had no idea what I was doing. The recipe called for an overnight rise on the dough and was unclear about exactly how to shape it. I stretched the hole too wide and wound up with bagels that looked like flat donuts. First and last time I will ever let the dough rise overnight in the refrigerator, it simply doesn’t work. However, I now had some basic knowledge of how to prepare bagel dough and proceeded to experiment with my own technique. Two days and a five-pound bag of flour later, I produced a share-worthy recipe. If you are like me and have never made bagels before then continue reading for step by step instructions with pictures so you can understand exactly how to go about this. Otherwise, you can skip this and go straight to the bottom for the recipe card. Let’s start by making the sponge for our dough. This step is crucial in giving the bagels that spongy texture on the inside. You want lots of air bubbles. You can put this right into the mixing bowl or your stand mixer. Stir everything together vigorously until it is smooth in texture. Cover the bowl with plastic wrap and set it in a warm place to rise. You want to let it double in size so it may take about an hour. I preheated my oven at the lowest setting which was 170 degrees F. Then I shut it off and left the door open slightly. Once I mixed the sponge I set it in the warm oven and let the door remain cracked. This produced a nice warm environment and my sponge took exactly 45 minutes to rise. Once the sponge is ready, add the remaining flour, salt, cinnamon, and maple syrup. Attach the dough hook attachment to your stand mixer and knead everything together on low speed for 10 minutes. You may need to add a tad more flour if the dough looks too wet or a tad more water if the dough looks too dry. Do this by the tablespoon if it’s necessary and try to do this early on in the kneading process. If you wait too long to make these changes then you will end up over kneading which will result in an extremely tough bagel. It may be necessary to stop the mixer and scrape the dough from the sides and bottom of the bowl. I had to do this twice. You can knead by hand if you don’t have a stand mixer; just knead for 10 minutes using as little flour as possible to prevent the dough from sticking. After the dough has come together, leave it in the bowl, cover, and let it rise until it doubles in size. This can take anywhere from 30 minutes to 1 hour. I used the same warm environment for the dough as I did for the sponge and it took my dough 30 minutes to rise. Check the dough by gently pressing two fingers into the center, if the indentation remains then your dough is ready. Place the dough onto a lightly floured cutting board and divide it into 8 even pieces. I shaped my dough into a circle and cut it in half and then cut each half in half. I shaped my four halves gently into balls and then sliced those in half. Once you have eight pieces, roll each one into a ball and place them on a lightly floured surface. Dust the tops of each ball with a little flour, cover, and let them rise once more for about 15 to 30 minutes. You want the balls to expand only slightly or else they will collapse during boiling. Now we get to shape our dough into the well-known bagel shape. Press the dough ball down slightly to flatten it just a smidge. Then press one finger right through the center. Pick up your dough ball and make a hole in the center where you pressed your finger. Using your index fingers, place each one through the hole on both sides of the bagel and rotate your finger around in a rolling motion. Be careful not to overstretch the center or you will have donut looking bagels. 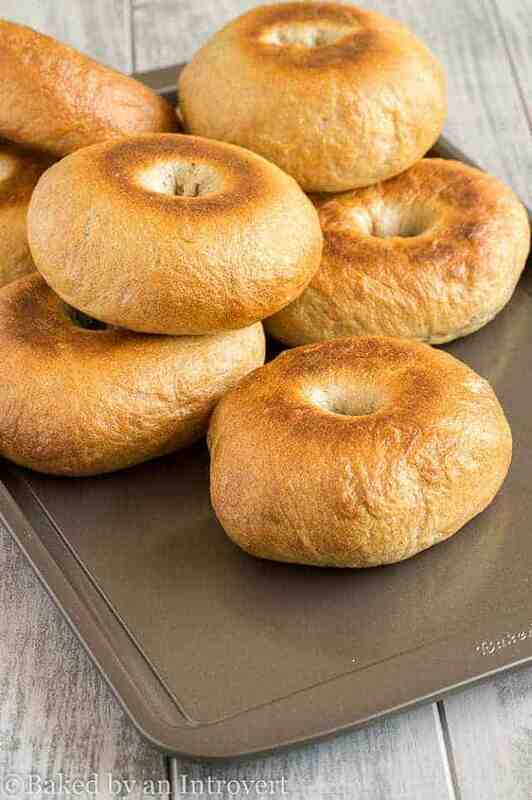 Bring water to a boil in a large shallow pot and boil the bagels for 1 minute on each side. Be careful when turning them. Let them drain on a wire rack. Place the bagels on a parchment-lined baking sheet and bake them for 25 minutes in a 400-degree F oven. Turn the bagel over halfway through to help them brown evenly. They will be a nice golden brown color once they are done. Your homemade cinnamon maple bagels are ready to enjoy plain or with your favorite spread! 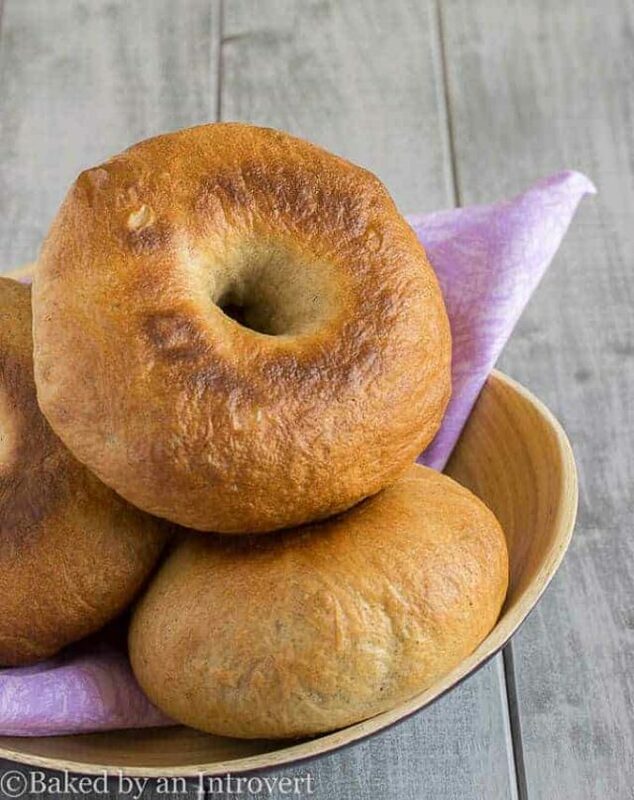 Crisp, chewy homemade bagels flavored with cinnamon and maple. In the mixing bowl of your stand mixer, combine 2 1/2 cups of the flour, yeast, brown sugar, and warm water. (Remember to stir the flour and spoon it into the measuring cup for proper measuring.) Stir everything together vigorously until it is smooth in texture. Cover and let it rise in a warm environment until it doubles in size, about 1 hour. Once the sponge is ready, add the remaining flour, salt, cinnamon, and maple syrup. Attach the dough hook attachment to your stand mixer and knead everything together on low speed for 10 minutes. You may need to add a tad more flour if the dough looks too wet or a tad more water if the dough looks too dry. Do this by the tablespoon if it’s necessary and try to do this early on in the kneading process. If you wait too long to make these changes then you will end up over kneading which will result in an extremely tough bagel. It may be necessary to stop the mixer and scrape the dough from the sides and bottom of the bowl. I had to do this twice. You can knead by hand if you don’t have a stand mixer; just knead for 10 minutes using as little flour as possible to prevent the dough from sticking. Cover and let rise until it doubles in size. This could take 30 minutes to 1 hour. Place the dough onto a lightly floured cutting board and divide it into 8 even pieces. Shape each piece into a ball and place them on a lightly floured surface. Dust the tops with a little flour, cover, and let them rise once more for about 15 to 30 minutes. You want the balls to expand only slightly or else they will collapse during boiling. Shape the dough by pressing the dough ball down slightly to flatten it just a smidge. Then press one finger right through the center. Pick up your dough ball and make a hole in the center where you pressed your finger. Using your index fingers, place each one through the hole on both sides of the bagel and rotate your finger around in a rolling motion. Preheat the oven to 400ºF. Bring water to a boil in a large shallow pot and boil the bagels for 1 minute on each side. Be careful when turning them. Let them drain on a wire rack. Place the bagels on a parchment lined baking sheet and bake them for 25 minutes. Turn the bagel over halfway through to help them brown evenly. They will be a nice golden brown color once they are done.